Wow, just noticed that I haven't post for over a month! I had better get on with this then! A few weeks ago I started another EPP. Mainly for something to do away from the machine. The idea came from here and I've been busy working out what to do and what it is for. I'm at filling in the negative space as I don't want to appliqué it on to a background this time. I think it is going well, you tell me. And the what for? Hoping that the hospital will take it for a pre term baby, it might be too big. There was also a tiny bit of fabric buying. 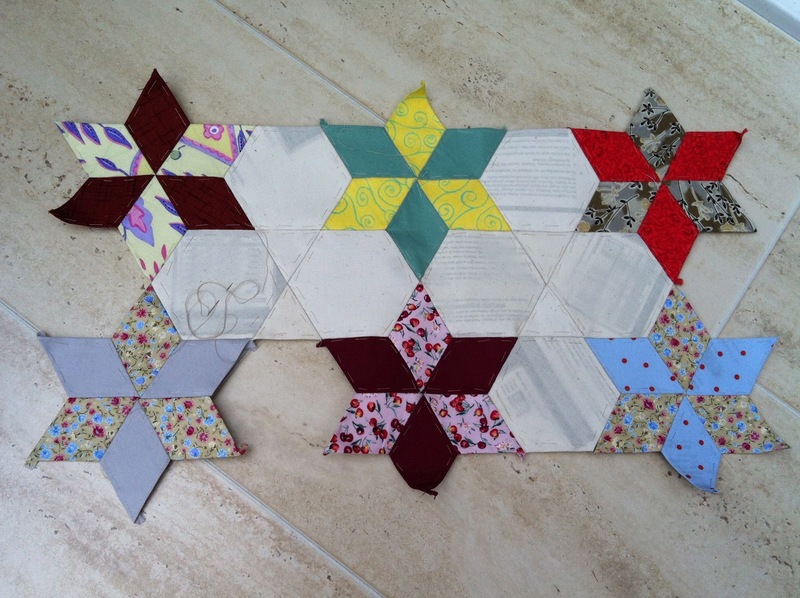 I'm setting myself the challenge of creating my Nel Watmore quilt design using a pack of her Katherine Wheel charm squares. I could tip myself over the edge but I think I could do with the challenge! Also, DD and I have decided to join the QAL at Lily's Quilts - Jack Attack. This could be more than I can cope with but we will see. Currently the Sew Intertwined is 1/3 done; really struggled with working out foundation piecing and Swoon is 4 done 5 to go. Just need the children to go back to school and then, oh yes I go back to work!